Balloon kyphoplasty is a modern, minimally invasive procedure for treating painful vertebral body factures on the thoracic and/or lumbar spine. This surgical therapy stabilizes the spine and relieves pain. For this field of vertebral body stabilization, joimax® offers the SPASY™ balloon kyphoplasty system. 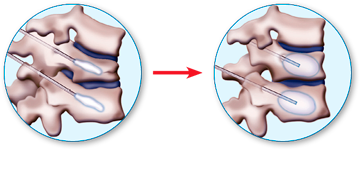 The term “kyphoplasty” comes from the Greek “kyphos,” meaning “hump,” and “plassein,” meaning “to form.” Balloon kyphoplasty is a successful surgical treatment option for painful vertebral body fractures and has been used in the USA since 1999 and in Germany since 2001. Another procedure for treating vertebral body fractures is vertebroplasty, which is the forerunner to kyphoplasty. Vertebroplasty has been used for over 20 years, especially in France. 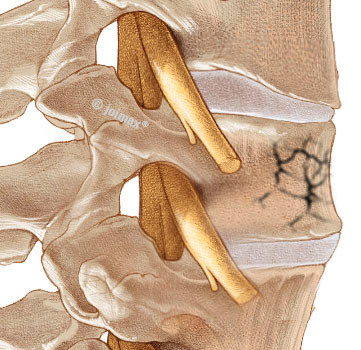 Balloon kyphoplasty is a pain therapy option for vertebral body fractures. If a vertebra is fractured, it means it has broken or collapsed (sintered). A vertebral compression fracture is often the result of osteoporosis (reduced bone density). But metastases in the vertebral body, tumors, or even genetic vertebral body defects like wedging of the vertebra can also cause fractures. Often conservative therapy and pain treatment such as bed rest, analgesics, physiotherapy, and support corsets fail to alleviate the condition quickly or to any significant extent. On the contrary: Limited mobility can lead to further osteoporosis and increased weakness in bone structure, thus heightening the risk for more vertebral body fractures. Two clinical studies from 2011 confirm the benefits of balloon kyphoplasty, which include rapid pain relief, increased quality of life, as well as an improved ability to cope with everyday activities as compared with conservative treatment1, 2. Balloon kyphoplasty can ease or eliminate back pain resulting from a vertebral compression fracture and restore the height of the vertebral body. The main objective of balloon kyphoplasty is to reduce and eliminate pain. Prior to the operation, physical and imaging tests are carried out such as X-rays and MRIs to determine the exact location of the fracture. The operation is performed by specialists under local or general anesthesia. Your doctor will discuss the most suitable anesthetic for you. A very small incision (approx. 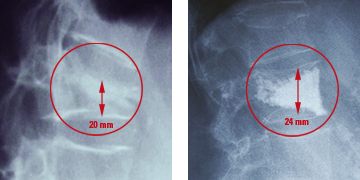 1 cm) is made on the back above the broken vertebra. A thin tube of several millimeters is then inserted through this incision into the painful, fractured vertebral body, through which a special balloon catheter is then inserted into the vertebral body and filled with a fluid and expanded. This creates a cavity and also realigns the vertebra. In the next step, the liquid is emptied from the balloon and the balloon is removed from the vertebral body. The cavity is then filled with bone cement, which supports the vertebral body. Approximately 45 minutes is needed to perform balloon kyphoplasty per vertebral body. Patients are able to move again soon after the procedure and can be discharged from hospital after just a few days. Like any other operation, balloon kyphoplasty is not completely without risks. Rates of complications are low, however circumstances may still arise during the procedure that may lead to complications. This procedure is not suitable for all patients The information on this Web page does not replace a consultation with your doctor. 1.Steven Boonen u. a., „Balloon kyphoplasty for the treatment of acute vertebral compression fractures: 2-year results from a randomized trial“, Journal of Bone and Mineral Research: The Official Journal of the American Society for Bone and Mineral Research 26, Nr. 7 (Juli 2011): 1627-1637. 2. James Berenson u. a., „Balloon kyphoplasty versus non-surgical fracture management for treatment of painful vertebral body compression fractures in patients with cancer: a multicentre, randomised controlled trial“, The Lancet Oncology 12, Nr. 3 (März 2011): 225-235. 3. Garfin, S.R., R.A. Buckley, and J. Ledlie, Balloon kyphoplasty for symptomatic vertebral body compression fractures results in rapid, significant, and sustained improvements in back pain, function, and quality of life for elderly patients. Spine. 2006. 31(19): p. 2213-20. 4. Ledlie, J.T. and M.B. Renfro, Kyphoplasty treatment of vertebral fractures: 2-year outcomes show sustained benefits. Spine. 2006. 31(1): p. 57-64. 5. Gaitanis, I.N., et al., Balloon kyphoplasty for the treatment of pathological vertebral compressive fractures. Euro Spine J. 2005. 14(3): p. 250-60.